It may sound weird even debating whether a quarterback with an 11-2 record and the NFL’s third best passer rating (second best QBR) is worthy of keeping his starting job. But, such is life when you are the rookie quarterback of “America’s Team,” and black, to boot. To be fair, Dak Prescott, the quarterback of the Dallas Cowboys, is backed up by a good, if not great player in Tony Romo, who is a star, if not a super one. Fans have come to love or love hating Romo over the years, as much for his off-field success (see Jessica Simpson) as for his exploits on the field. However, as much as the admiration for Romo may be driving the buzz or undercurrent of Dak Prescott doubt that persists among fans and media members, there is more to it than that, of course. Yes, there’s that rookie thing. Rookie success is rare, but far from unheard of, especially on an otherwise veteran team. Greats, such as Dan Marino, John Elway and Ben Roethlisberger have led their teams to playoff appearances and beyond in their rookie seasons. So have Bernie Kosar, Matt Ryan, Joe Flacco, Andy Dalton and even Mark Sanchez. Prescott could become great in the future, as this rookie season seems to suggest. In the alternative, one could surely see Prescott on a similar career path as a Ryan, Dalton or Flacco. But, there seems to be additional doubt when it comes to Prescott; more of a “well, they’ll figure him out soon” mentality that appears to exist for some, but not others, at the quarterback position. Yes, it’s that black quarterback thing. Unbelievably, it’s still a thing. How could it not be? Police mistreatment and brutality is still a thing. Disparate treatment by the judicial system is still a thing. Donald Trump is now a thing. So, surely little old football still has its issues. A lifetime of witnessing mistreatment can do that to you. But, as the saying goes: just because I’m paranoid doesn’t mean they’re not out to get me. Or, Dak Prescott in this case. The long history of the plight of the black quarterback has been well documented, but doubt exists, just like there is doubt about the continued need for affirmative action, for example. But, the black quarterback thing is real. A study done last year by Brian D. Volz for the Journal of Sports Economics, found that from 2001 to 2009 there is evidence that suggests that black quarterbacks are between two and two and a half times more likely to be benched, when controlling for other factors, including injury, age, quality of the backup quarterback, and other factors. According to the study, between 2001 and 2014, the percentage of black starting quarterbacks on opening day fluctuated between 16%-28%. That is pretty low when you consider that black players make up almost 70% of the entire league and account for over 80% of starters at the running back and wide receiver positions. However, as referenced earlier, this is not an NFL problem, it’s a societal one. Even on a football level, discrimination of blacks at the quarterback position starts at the pop warner levels and is perpetrated by both black and white coaches. But, I’m here to tell American football fans and media that your fears and distrust are misguided and unwarranted. 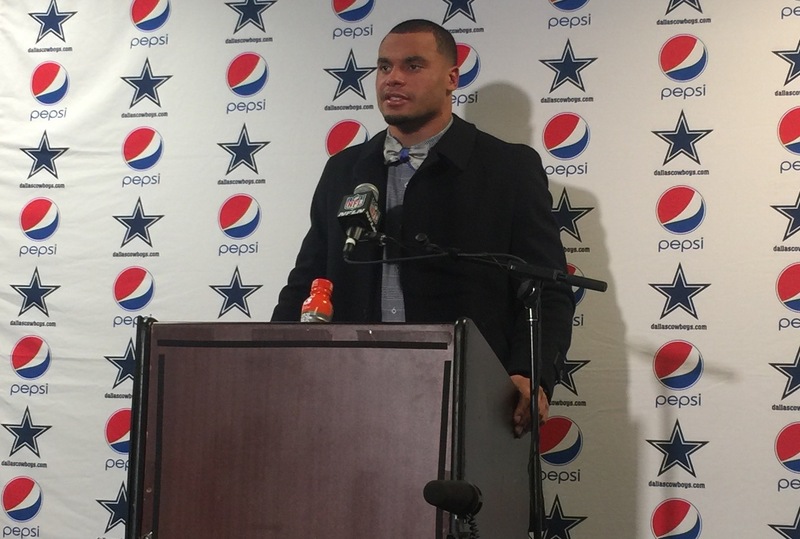 Dallas Cowboys' quarterback Dak Prescott addresses the media Sunday night. Prescott has not been good this year, he’s been great, and he is the player most capable of leading this year’s Cowboys to their promised land. After the Cowboys’ 10-7 loss to the New York Giants and easily Prescott’s worst game of the season, many jumped at the opportunity they had been impatiently waiting for: to clamor for Tony Romo to get his job back. On a cold, snowy and rainy night in East Rutherford, NJ, Prescott was 17/37 for 165 yards, 1 touchdown and 2 interceptions. The Giants played their best defensive game of the season and handed the Cowboys their second loss of the season. After those two interceptions on Sunday night, Prescott now has a whopping four on the season, fewer than any year-long starter, other than Sam Bradford (three). His 20 touchdown passes put him in the top half of league quarterbacks. Prescott is in the top ten in completion percentage and top three in passer rating and QBR (mentioned for the second time just for emphasis). In Tony Romo’s 13-year career, he only reached or eclipsed Prescott’s current passer rating of 102.7, twice; in 2011 (102.5) and in 2014 (113.2). Needless to say, Prescott has been very impressive in this, his rookie season. As for being a winner, it’s clear Prescott has that quality, as well. “There’s been a theory in the scouting business that players that come from Mississippi State don’t really do well in the pros, for some reason, they’re just not good pro players,” Dallas Cowboys reporter Nick Eatman from DallasCowboys.com said on the Bill Rhoden On Sports podcast back in September. His boss seemed to agree, at least immediately after Sunday night’s loss. For his part, Prescott isn’t letting the Romo talk distract him and sounds like he’s looking straight ahead. Similar to how he’s played so far this season should sound good to the Cowboys’ players, organization, and their fans. The team appears to have a firm grip on reality, it’s the fans and some members of the media who need to let go of that old, misguided way of thinking. Let the Cowboys be great again. Let Dak live.